I'm never really alone in the studio as you can see. I've been a lover of dolls all my life. 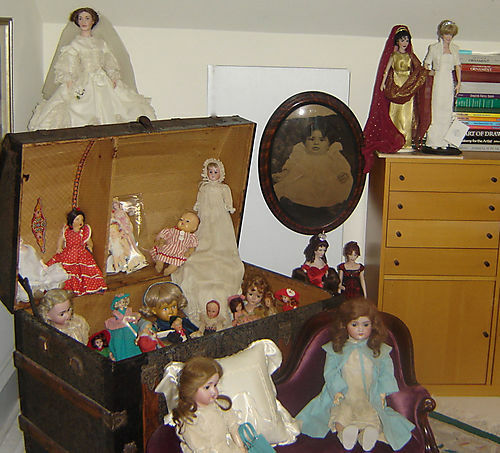 My collection includes dolls from The Franklin Mint (some of which I designed), dolls from my childhood, and dolls that were my Mother and Mother-in-Law's from their childhoods. The doll in the blue coat belonged to my Great Aunt Carrie, who was born in 1897 and received this German made doll when she was 10 years old. By the way, the baby in the oval frame is my maternal Great-Grandmother.